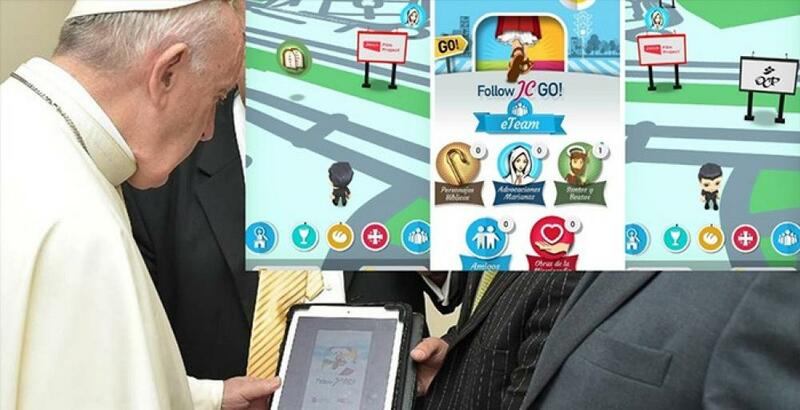 Pope Francis has blessed a new app blessed similar to Pokemon GO but called ‘Follow JC Go!‘. With this game smartphone users can go after biblical characters and saints. You can also answer biblical trivia asked by Moses, and gain points. So far the Spanish version has been released but English, Italian and Portuguese versions will follow in the next few weeks. Follow JC Go! was developed by Fundación Ramón Pané, an international team of Catholic helpers. Pokemon GO was released in 2016 and has had nearly 800 billion downloads. The production of this JC GO involved 43 designers, theologians, Bible experts, Church historians and engineers a reported 32,000 hours. Pope Francis gave Follow JC Go! his Blessing!